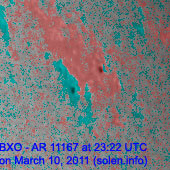 Last major update issued on March 11, 2011 at 05:35 UTC. 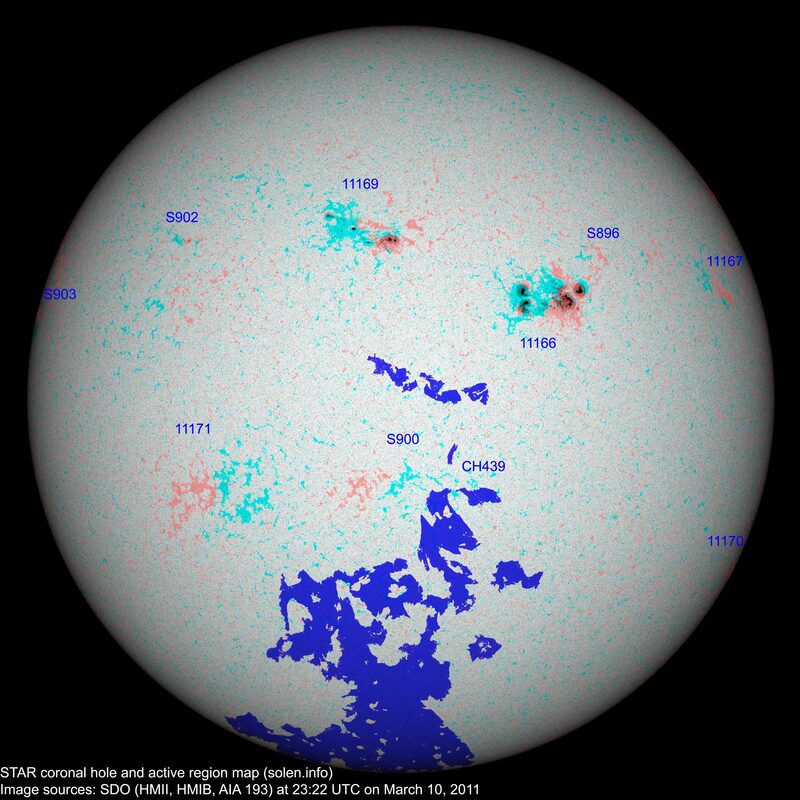 The geomagnetic field was quiet to minor storm on March 10. 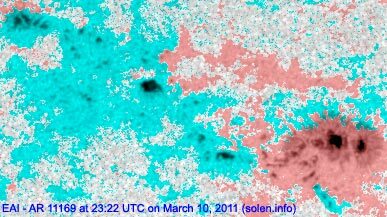 A solar wind shock was observed at SOHO at 05:45 UTC. 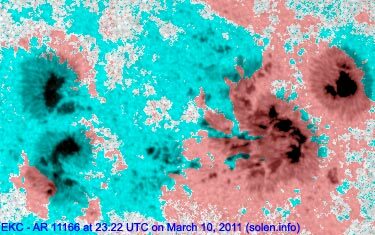 While the increase in solar wind speed was unimpressive and the total IMF field was low to moderate, the IMF has been southwards since the arrival of the CME. 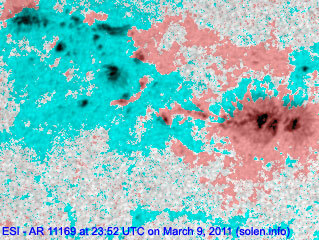 Solar flux measured at 20h UTC on 2.8 GHz was 131.3 (increasing 40.1 over the last solar rotation). 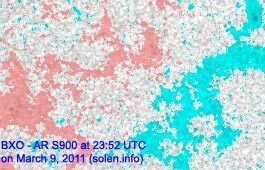 The planetary A index was 20 (STAR Ap - based on the mean of three hour interval ap indices: 19.5). 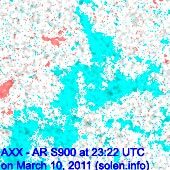 Three hour interval K indices: 22443245 (planetary), 22433233 (Boulder). 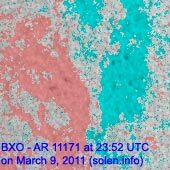 Region 11166 has several small magnetic delta structures in the large central penumbra and one delta in the southeastern trailing penumbra. Another major flare is possible. Flares: C2.9 at 03:58, C6.2 at 07:12, C4.2 at 13:25, C4.7 at 13:46, C2.0 at 14:24 UTC. Region 11167 was quiet and stable. 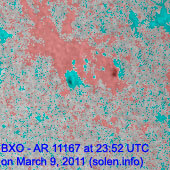 Region 11169 decayed in the trailing spot section while development was observed in the leading spot section, there is only minor polarity intermixing. 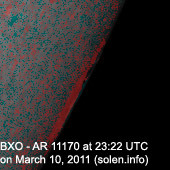 Region 11170 rotated partly out of view at the southwest limb. Region 11171 was quiet and stable. 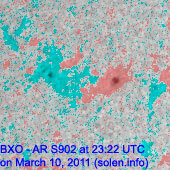 Region S891 behind the southwest limb was the likely source of a C4.0 flare at 19:07 and an M1.1 flare at 22:41 UTC. 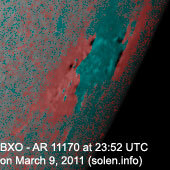 The flares were observed at the southwest limb, however, there is a slight chance AR 11170 might have been involved. 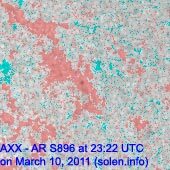 [S900] Tiny spots emerged in an old plage area in the southeastern quadrant on March 8, a single tiny spot was still vsisible on March 10. Location at midnight: S18W02. 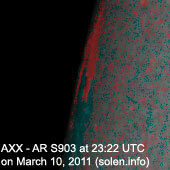 March 8-10: No obviously Earth directed CMEs were observed in LASCO and STEREO imagery. 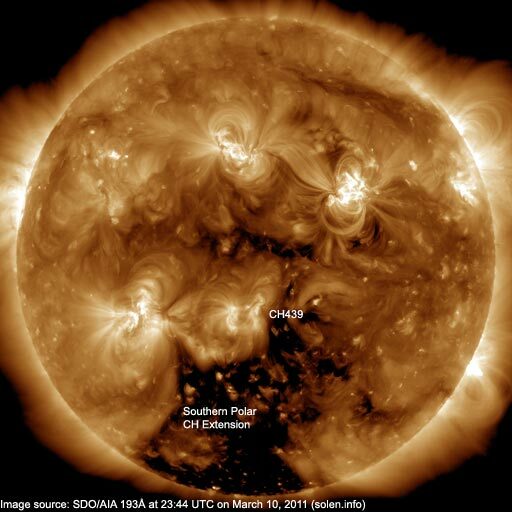 The geomagnetic field is expected to be quiet to minor storm on March 11 and quiet to unsettled on March 12 due to CME effects. 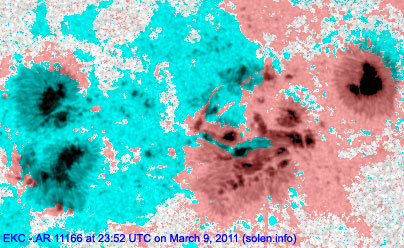 On March 13-14 quiet to unsettled conditions are possible as a stream from CH439 dominates the solar wind.